You can get the urge to play casino games at any time, and thanks to the Vegas Paradise Casinos Android App you will be able to play a large range of both NextGen Gaming and Microgaming powered games from wherever you happen to be, either completely free of charge or for real money. This newly launched online and mobile casino site VegasParadise.com have truly hit the ground running, and are giving away a huge sign up bonus to all newly registered real money players, and their state of the art Android App comes packed with every type of game you could imagine, and several you may never have come across before. Downloads in Seconds – Having played at several mobile casino sites via their respective Apps we did notice the speed at which the App downloads and installs was much quicker than some other Casino Apps. We had the entire casino downloaded and installed onto our mobile in less than 20 seconds and the size of the download was only 4.42MB. Tip for Downloading – Depending on what type of contract you have with your mobile phone network provider, it may be beneficial for you to download the App via a Wi-Fi connection as opposed to using up your allocated date allowance. App Permissions and Registration – When you opt to download and install the Vegas Paradise Casino App it will not require any local permission and as such it does not need access to other parts of your device such as your location, phone book or contacts or your image folders. The initial registration process involves you filling in your name and email address and once completed you can then log into the App and start to play their games for free or for real money. When we tried out the Vegas Paradise Casinos App there was over 50 great looking games on offer, we tried out several of the games to see how they played and paid, and below are those which did appeal to use based on the size of the jackpots, the low house edges and the high payout percentages on offer. 3 reel Slots – When you are wishing to play fast playing yet high paying slot games the 3 reel slots on offer via the Casino App at this casino site can always be relied on to deliver the goods, you will find classic slots such as the Break Da Bank slot game on offer which has special wild multiplier symbols on the reels which can help massively increase the value of any winning combination they help to complete! Bonus Game Awarding Video Slots – There is a massive suite of video slots that can and do award all manner of unique bonus games. Look out for the Viola slot game which is a slot offering 243 ways to win on each game you play or slots such as the Halloweenies slot which can award you with a free spins bonus game or a pick to win type of feature round. Video Poker – You will find the high paying Jacks or Better video poker game and a Deuces Wild variant waiting for you when you log into the Vegas Paradise Casino App. Both games offer a unique pay table and can be played for different stake options. Low House Edge Classic Blackjack – The Vegas Paradise Casino has the Classic Blackjack game from Microgaming on offer, and this is a multi stake game which thanks to a series of player friendly rules and betting options boasts a house edge of just 0.13%. That house edge is considerably lower than all other mobile Blackjack games and as such will give you the maximum winning opportunities when you play this game with perfectly strategy. One aspect of playing at any online or mobile casino for the very first time most players find appealing is the new player sign up offers and promotions that you are going to be able to take advantage of whenever you make your very first deposit into any such site. When you choose to access and play on the Vegas Paradise Casino App for real money at VegasParadise.com/mobile they will give you a 100% deposit match bonus on which you can claim up to a maximum of €/$/£200 in bonus credits. This offer is subject to change at any time, so if interested please check their mobile website for more details and for information on the fair play terms and conditions attached to this bonus offer. You are also going to be able to earn comp points when playing any of the games on their Casino App for real money, and the more you play the more comps you will amass and these comps can then be exchanged for real money casino credits. There are actually various sites that allow people to download free applications for the android. These sites also offer a lot of different ideas about applications that you may like! Some people cannot think of everything off of the top of their heads, but once you get searching – there are hundreds of apps that you may be interested in. There are apps that can help people count their calories if they are trying to stay on track, there are pregnancy trackers, pedometers, stock market tickers, credit card trackers, weather stations as well as news stations, pretty much anything you can think of! You do not always have to pay for great applications. People may wonder why there are free applications, this is a way other companies can expand and adverted for free! There are normally links that are connected to another site; this is how they get people to their sites. Looking for a boost to an android machine to play a long playlist of songs, look no further than the Power Amp Music player, available on the android market. This is an advanced music player and can play almost any format of music. It features both a treble and bass adjustment as well as a 10 band equalizer. 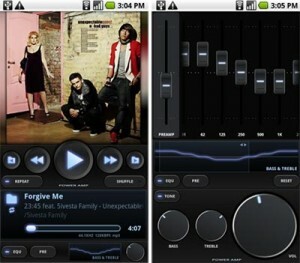 Songs can be played from both the system media library as well as from any folder on the phone. The program comes with 4 different widgets and many different customizable options. The interface of the program is easy to use and is designed in a pleasing manner. The app also allows users to download album artwork for the majority of downloadable songs. While some may think that the almost five dollar price tag is a little hefty, with the amount of different themes and options available it is well worth the extra cost.